Final painting created at the event. 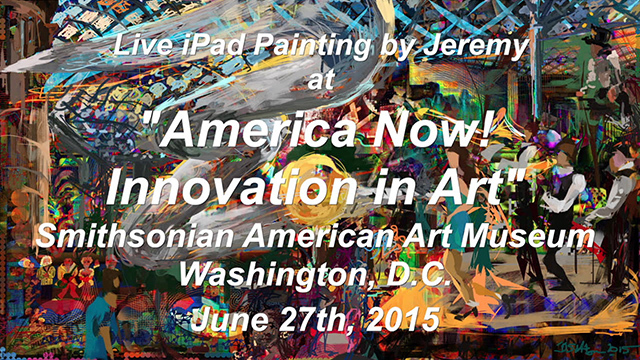 On Saturday, June 27th, 2015, between 4pm and 7pm, I performed live iPad painting at the Smithsonian American Art Museum’s “America Now! 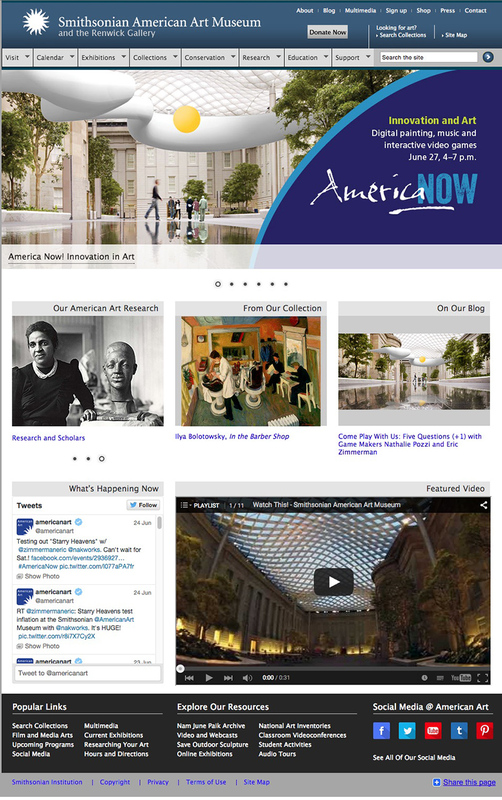 Innovation in Art” free public event in Washington, D.C. – the finale of the “America Now!” series. 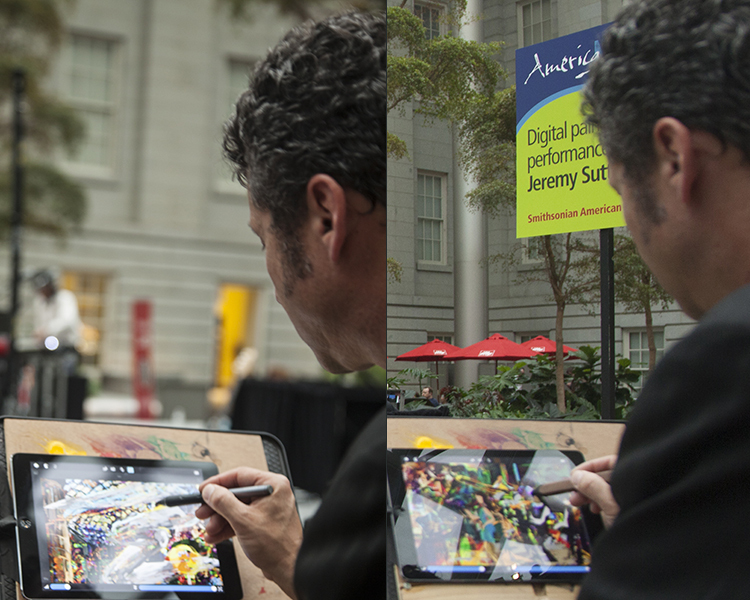 I worked on one painting throughout the event, inspired by the scene in the Robert and Arlene Kogod Courtyard. The resulting artwork is shown above. It is an observational painting created directly from scratch freehand, without use of photography. 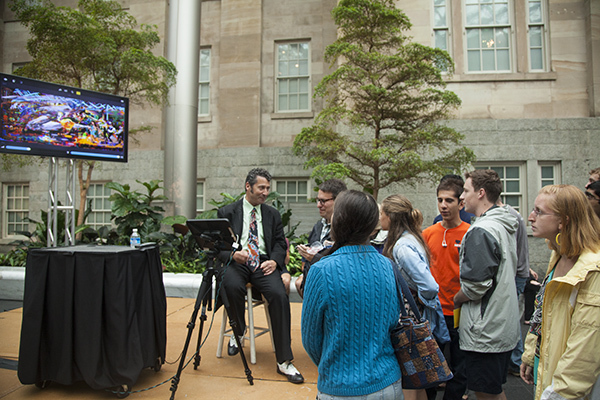 My painting process was displayed realtime on a large LED screen in the beautiful Robert and Arlene Kogod Courtyard of the Museum for attendees to enjoy. The event included electro-swing music from the band Good Co. and DJ Eliazar, which inspired my brush strokes! The band and DJ are both represented in the painting. I used an iPad Air with the app Sketch Club and the styluses Pencil by 53 and the Wacom Intuos Creative Stylus 2, all of which are fabulous tools I highly recommend. 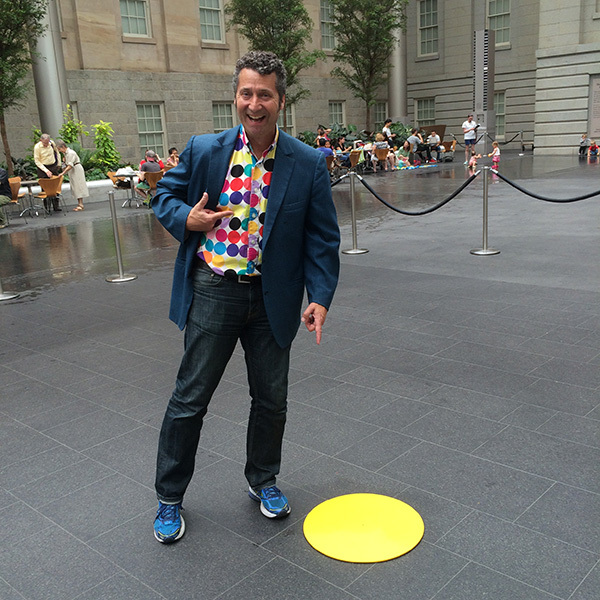 I spent the day before this event in the museum (a building shared with their sister Smithsonian museum, the National Portrait Gallery) sketching and getting inspiration from the incredible art collection, as well as from the magnificent historical National Historic Landmark building in which the collection is housed. 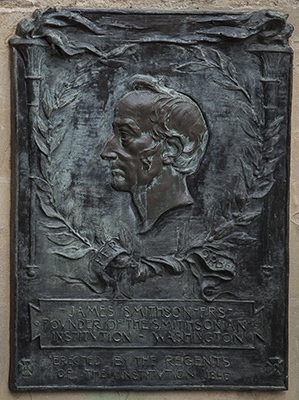 It is the third public building constructed in early Washington, D.C., (after the White House and the U.S. Capitol), former home of the Patent Office (from 1840), location of President Lincoln’s second Inaugural Ball, and one that was saved from demolition by an act of Congress. I then created a background, inspired by the collection, on which to begin my painting performance. If you look carefully you may even notice some elements of Malcah Zeldis’ Miss Liberty Celebration (1987), Romare Bearden’s Empress of the Blues (1974) and Marvin Beerbohm’s Automotive Industry (1940, Works Progress Administration commission for the Detroit Public Library) showing through. 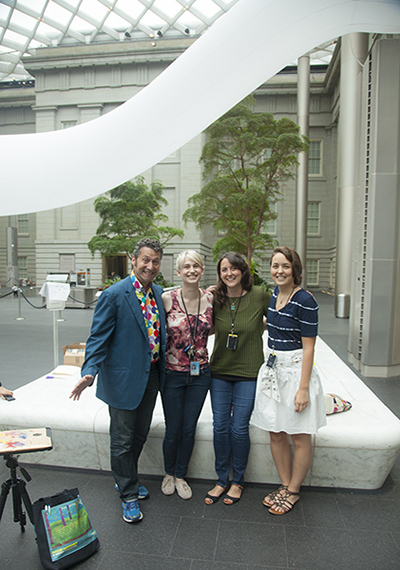 With Kaylin, Katy and Kara from the fabulous museum team before the event. 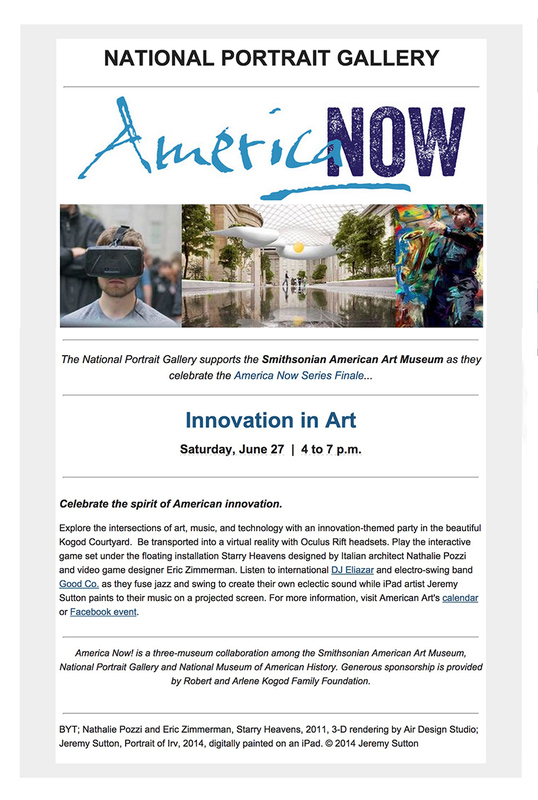 Thank you and congratulations to the great staff of the Smithsonian American Art Museum who orgnaized this event, and to the generous sponsors of “Innovation in Art” and the “America Now!” series, the Robert and Arlene Kogod Family Foundation. 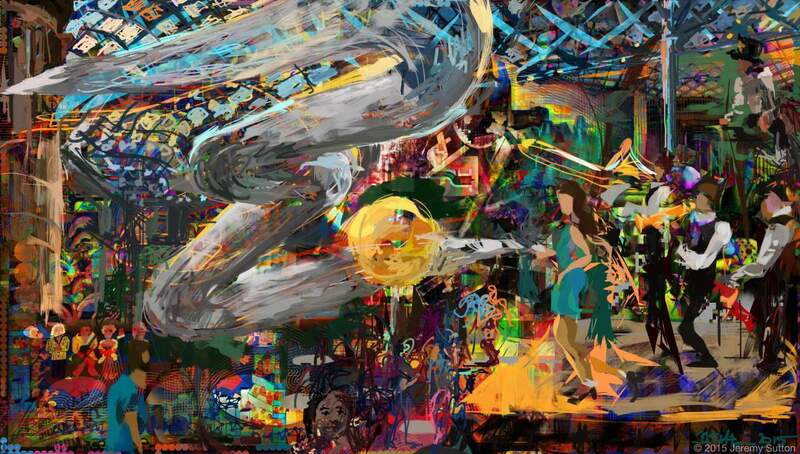 The concept that paved the way for this performance, in which I built up a painting of the scene throughout the event, was my live digital painting performance using Corel Painter on a MacBook Pro with a Wacom Intuos pen tablet at the Scotiabank Nuit Blanche arts festival in 2014, where my painting was displayed in real time on seven 8′ x 8′ screens along Spadina Street in downtown Toronto. 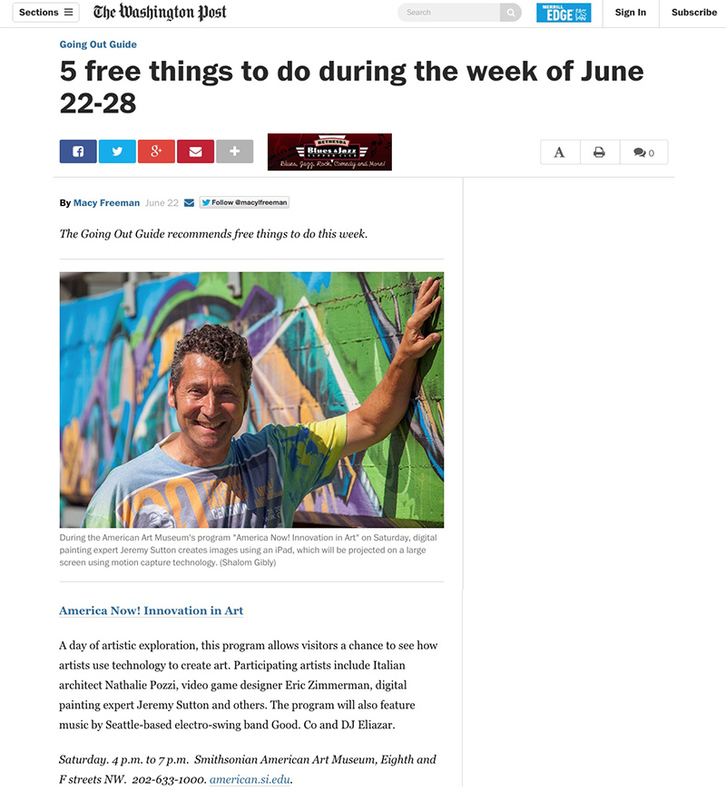 The painting of the saxophone player reproduced on the Smithsonian web and event pages associated with this event is my portrait of Erv that was created using Corel Painter and a Wacom IntuosPro pen tablet on an iMac. Please note that the web pages reproduced here are screen captures taken on the day before the event. Any blue “links” shown in the images are not live links! I’ve included links to the actual pages though they may have changed since I captured them. 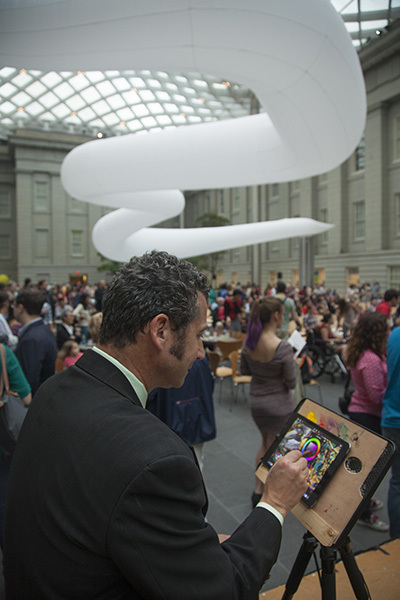 Saturday, June 27; 4–7 p.m.
On Saturday, June 27, the Smithsonian American Art Museum will close the series with “Innovation in Art.” Visitors will be able to explore how artists are using technology to propel their work. Digital-paint pioneer Jeremy Sutton will paint a la David Hockney-style on an iPad, with the image projected on a large screen using motion-capture technology. Sutton will paint to the beats of electro-swing band Good Co. and DJ Eliazar. 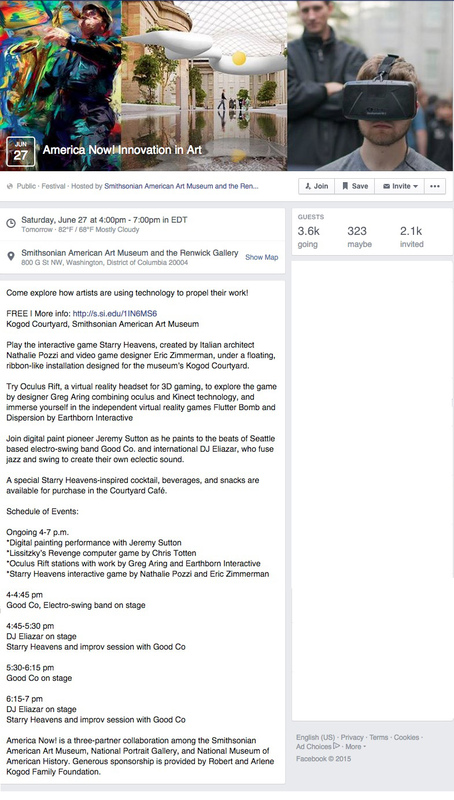 Visitors will be able to wear an Oculus Rift, a virtual-reality headset for 3-D gaming, to explore Craig Gilbert’s 360-degree films, Earthborn Interactive’s games or be transported into artwork by Greg Aring. 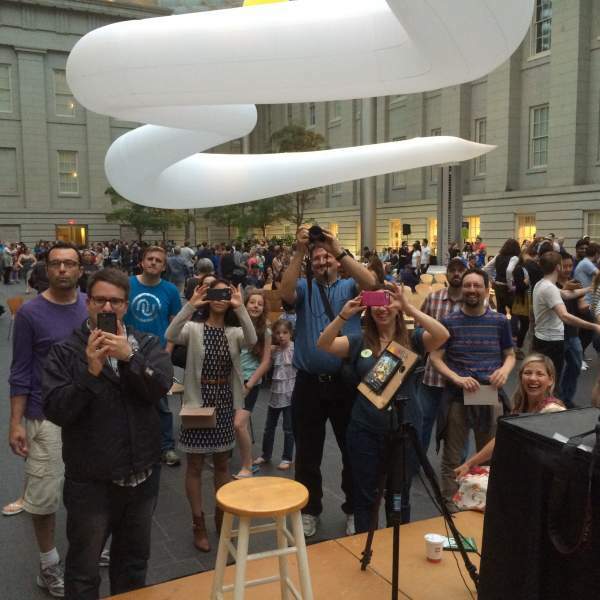 In addition, attendees will have the opportunity to play the interactive game Starry Heavens, which debuted at MOMA in 2011. 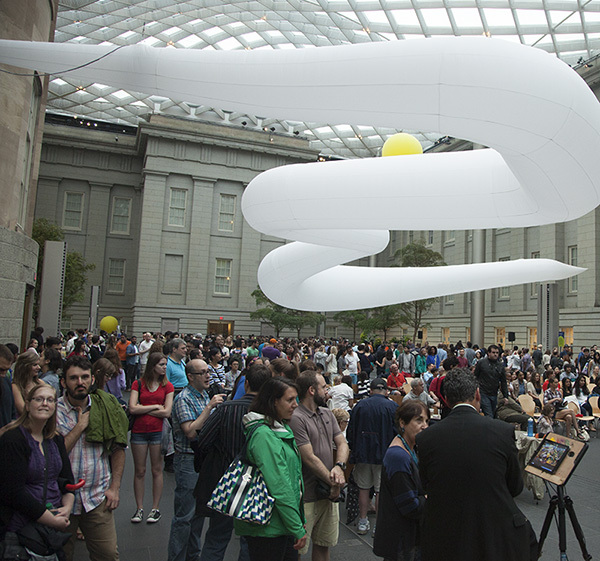 Created by architect Nathalie Pozzi and video-game designer Eric Zimmerman, the giant canopy for the game has been customized for the museum’s Kogod courtyard space to invoke the experience of the northern lights. 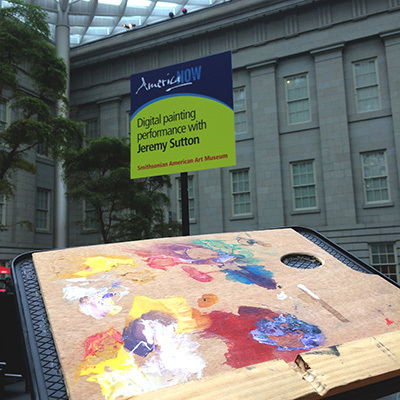 Jeremy, I really enjoyed your video on how you started and progressed through your artwork on your iPad at the Smithsonian. It was interesting seeing the area of the people and the events taking place and how you incorporated them into your picture, fascinating. keep pushing our favorite medium, Jeremy! Sent your link to all my (traditional art) friends. BTW, Wacom Intuos Stylus 2 does not work well on iPad Air 2. I had to return the stylus and go back to the Wacom Intuos Stylus 1, which does work just fine.